This year, World Centric celebrates the 10-year anniversary of working toward our vision of a just and sustainable world. We want to thank you – our customers – for taking steps in purchasing products made from plants, not petroleum. It is actions like this that, one by one, will lead us to our vision. With this newsletter, we wanted to share with you some of the amazing work being done by our nonprofit partners, customers and employees as they too strive to make a better world. We’d love to learn about what you are doing in your own life or with your company! If you would like to share your story, send us an email! Louie Poore’s history with specialty coffee goes back to college. He’s worked as a barista (even competitively), coffee roaster and seller, café consultant, and is now Director of Marketing at Taylor Maid Farms (TMF) in Sebastopol, California. TMF is known for its variety of high-quality, certified organic coffees and its hip and charming coffee bars. WC: TMF has been using World Centric at the coffee bar since day one. What prompted that decision? LP: We have a big focus on organics and sustainability. It just made sense to be using compostable products. It falls in line with Taylor Maid’s vision for minimizing our impact on Mother Earth. WC: What sets TMF apart from other coffee roasters and cafés? LP: We do a very good job at being approachable. We offer a lot of options all sitting very high on the quality spectrum but still tailored toward a variety of tastes, from blends and single origin coffees to dark roasts and organic teas. For us, sustainability, approachability, and quality are the three pillars we are working off of. WC: I just have to ask, you mentioned that you’ve been a competitive barista: have you won any awards? LP: Well…no. But I’ve captured minds and hearts. WC: Anything else you’d like to add? LP: It means a lot to be partnering with World Centric as a local business and for us both to be contributing to a shared goal of being better businesses. 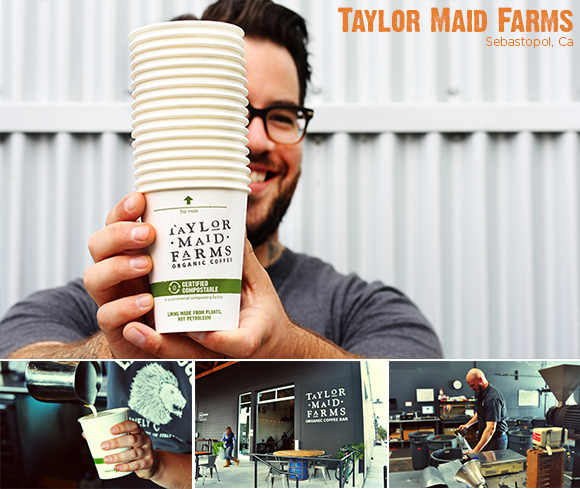 Find out more about Taylor Maid Farms online or visit their coffee bars in Sebastopol and San Rafael, California. "Every choice you make matters and each day we each have the opportunity to help bring that world into being, together, through each of our daily actions." 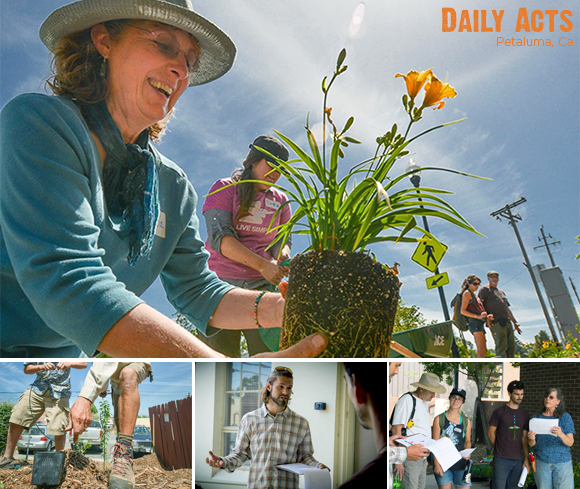 Daily Acts, a non-profit organization in Petaluma, California, grew out of an unwavering belief in our power to create a better world by inspiring people to live to their potential through simple daily actions that nurture community and regenerate nature. Since 2002 they have been providing education programs promoting skill-building, influencing green policy, and encouraging widespread change throughout communities. Ryan Johnston first came in to contact with Daily Acts through a volunteer workday building a water-wise garden. He caught Daily Acts’ contagiously positive and proactive vibe and within a few weeks of the event was an intern and a few months later was on staff full time. WC: As a newcomer to the town of Petaluma, World Centric wanted to support the efforts of Daily Acts to create a more sustainable and resilient community where we live and work. How does our support help your organization grow? RJ: We’re so grateful to have awesome community partners like World Centric, for both your financial support and for your leadership in modeling a new paradigm of business that truly takes care of people and planet in a deeper way. Your leadership inspires us and equips us with inspiration to share with other businesses seeking to take steps toward greening their practices. The financial support allows us to hire young emerging leaders in their field, such as myself, and increase our capacity to continue to grow initiatives to reach more people and new audiences. WC: What does your role as Homegrown Programs Coordinator entail? RJ: My role focuses on supporting folks in living a richer, more resilient existence that is less resource intensive, starting in their homes and backyards. I give talks and host tours and workshops connecting folks with others who are living and modeling these solutions in their lives. I am also part of the core organizing team for the Community Resilience Challenge, which helps promote this grassroots sustainability movement across the region and beyond. WC: World Centric recently participated in the Community Resiliency Challenge. It was amazing to watch Daily Acts surpass its goal. What was a personal highlight of this year’s challenge for you? RJ: So many thanks to World Centric for both sponsoring the CRC and participating in it! A personal highlight was coordinating the install of “Our Front Yard”, an edible living history garden at the Sebastopol Library and City Hall Complex, two of west Sonoma County's most trafficked buildings. The garden demonstrates four eras of plant cultivation in the region as well as ecological gardening techniques. WC: Many of DA’s current programs focus on conserving water due to California’s current drought. What is one simple, water-wise act we can all participate in? RJ: We can all reduce our use by going low-flow: adding aerators to faucets and upgrading showerheads, toilets, washing machines, and dishwashers to water-conserving models. Fixing leaks is another easy step. Big gushing leaks are usually quick to be fixed, but small leaks that go untended can really add up over time. WC: What is your favorite daily act? RJ: Giving gratitude. There is so much broken and out of balance in the world that it's easy to lose sight of all the incredible solutions emerging, the amazing people living into their potentials, the power each of us holds and the sheer wonder of being alive. By continually re-centering on gratitude and offering it often, I find more things to be grateful for seem to show up. Said another way: what you appreciate, appreciates. When I'm bubbling over with great-fullness within, I can't help but share! I am passionate about living life with an attitude of ’always learning’. If we approach another, especially those we consider different from ourselves, with an openness and curiosity we have an opportunity to enlarge our own understanding of ourselves...of one another... of life...of the world. The Tenderloin is a neighborhood known for having some of the highest rates for violence and drug activity in the beautiful city of San Francisco. In these dark streets, two women are shining a light on the issues of poverty and need. Faithful Fools Street Ministry is an educational and charitable organization founded and run by Carmen Barsody and Kay Jorgensen. Their purpose is simple: acknowledge each human’s incredible worth and shatter myths regarding those living in poverty. This manifests through a variety of programs spanning arts, education, advocacy, and accompaniment. When Faithful Fools approached World Centric with a request for a product donation to replace the styrofoam they were using, we were happy to assist them in becoming more sustainable. Carmen, co-founder and resident at the “Fool’s Court” (home of Faithful Fools), took a few minutes to share with us about their work. WC: Faithful Fools offers assistance to people in a wide range of ways. What is the greatest need you see among the people you work with? CB: Beyond assistance with the basic needs of supportive relationships, housing, and food, people need to be seen as a person; not a “homeless” person, a “mentally ill” person, an “addicted” person, or a “poor” person, but just a person with worth and dignity. All of us are human and all of us have a story. WC: One of your programs, in conjunction with San Francisco Night Ministry, is to feed those living on the streets in the Tenderloin. What makes this program significant to you? CB: To share a meal is a natural way to bring people together. Night Ministry provides meals at times when the larger institutions do not. Most places serve a noon meal but Night Ministry operates from 10pm-4am. Plus there is an interest in serving nutritious meals rather than foods that fill one up with just starches. WC: World Centric is thrilled to be able to provide the tableware for these dinners. How else can we, and others, get involved? CB: It would be great to have folks join us for any of our programs and/or to come do a Street Retreat with us. A retreat is a day spent on the streets, paying attention to our assumptions, judgments, fears, and personal experiences that arise as we walk. It was our "founding act" as Faithful Fools. Since 1998 we have had more than 5,000 people participate in street retreats with us. It is a great way to ground us in our understanding of ourselves and our experiences as we open ourselves to a relationship with people and places we often are encouraged to stay away from. 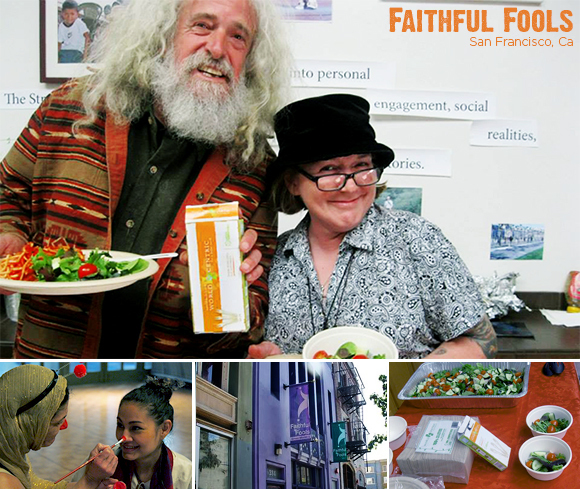 To get involved with Faithful Fools email Carmen at fools@faithfulfools.org or visit the Fools Court at 234 Hyde Street in San Francisco. The question now comes back full circle: is our environment, national waste reduction initiatives, and personal health and safety worth twenty-five cents? Realizing there was no local source for the purchase of sustainable packing, she founded the Out Island Eco Company and began providing an alternative to Styrofoam™ in the form of World Centric products. “I wanted to work with a manufacturer that shared my passion for education -- a company where the focus wasn’t just on products, but on understanding the issues and providing a solution.” Juliette said of her choice of World Centric. 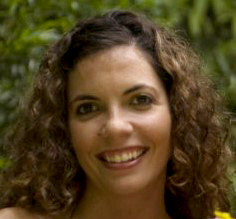 In October of 2013, Juliette officially joined the World Centric team where she works to educate on waste reduction from the ground level up. Due to her efforts in the Bahamas, the Ministry of the Environment and the Ministry of Tourism asked Juliette to write an article for their second-ever publication of EcoBahamas. The article address the specific needs surrounding waste diversion in the Caribbean and how compostables provide both a sustainable and economic solution. Read her article, “25¢ — Pocket Change to Change the World”, HERE! Wheat Straw Fiber Napkins and Facial and Bath Tissue–World Centric is proud to announce our very own line of facial and bath tissues made from wheat straw fiber (90% minimum), an annually renewable resource. Converting this fiber into our products reuses a cast-off resource and requires less energy than tree-based fiber. Unbleached napkins also require less water and fewer chemicals!